The greater RVA area is broken up into multiple zones. Below, find a complete list of Real Estate zones in the Richmond Virginia area. 10-Richmond – Bound by the North by I-64. East, City of Richmond Line. 20-Richmond – Bound on the North by City of Richmond line. East, Powhite Pkwy. South, James River, West, Henrico County line. 24 – Goochland County – Bound on the north by I-64. East, Goochland County line. South, James River. West, Goochland County line. 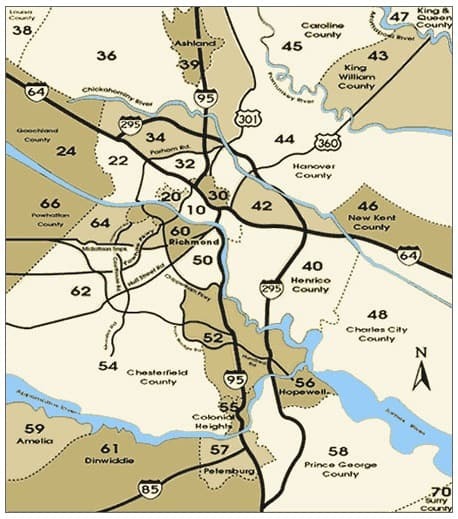 32 – Henrico County – Bound on the North by City of Richmond. East, Henrico County line. West I-64. 34 – Henrico County – Bound on the North by Chickahominy River and Henrico County Line. East, Chickahominy River and Henrico County line. South, Parham Rd. and I-64. West, Henrico County line. 42 – Henrico County – Bound on the North by Henrico County line. East, Hanover County line. South, Hanover County line and Chickahominy River. West, Rt. 301. 60 – Richmond – Bound on the North by James River. South by Rt. 360 (Hull St.) West, Chippenham Pkwy. 62 – Chesterfield County – Bound on the North by Rt. 60 (Midlothian Tpk). East, Chippenham Pkwy. South, Rt. 360 (Hull st.). West, Chesterfield County line.